Posted on September 29, 2015	by Derek "Gamer Crash"
Welcome back to Emergent Storytime dear friends, where you and I sit around a metaphorical campfire and share stories of emergent gameplay and some of the random and crazy things that can happen in our favorite open world games. Last time I took a look at Metal Gear Solid V: The Phantom Pain, so make sure to go read up on that one first. Today, we’re going to take a look at Mad Max, a game which unfortunately launched on the same day as Metal Gear Solid V, and was quite literally overshadowed. It’s a great game in it’s own right, but I’ll save that for another post. For now though, let’s have a look at some of my (mis)adventures in the wasteland. Lord Scrotus has a number of camps located around The Great White. The game will teach you that rushing headlong into these camps will do nothing but make your life a living hell as outer defenses and a rallying call will complicate matters. Instead, the smarted option is to take out the defenses first. At one camp in particular, I had a great vantage point of a few sniper towers. Trying to carefully snipe each enemy without being spotted, I inched my car closer to get the perfect shot. Unfortunately for me, the familiar sound of yelling shot through my speakers as a cloud of flying debris and fire rocked my view. A roaming War Boy patrol had found me and slammed headlong into my car, making life much more difficult. Jumping into the driver’s seat, I peeled out in an effort to escape or at least buy enough time to retaliate without the car getting critically damaged. A few shots from my grappling hook, I was able to tether and rip a driver right out of the car, sending his body flying across the landscape and causing the now empty car to steer into the second patrol car. A few bashes later, the second enemy car was reduced to scrap and I was able to resume my outpost strike. 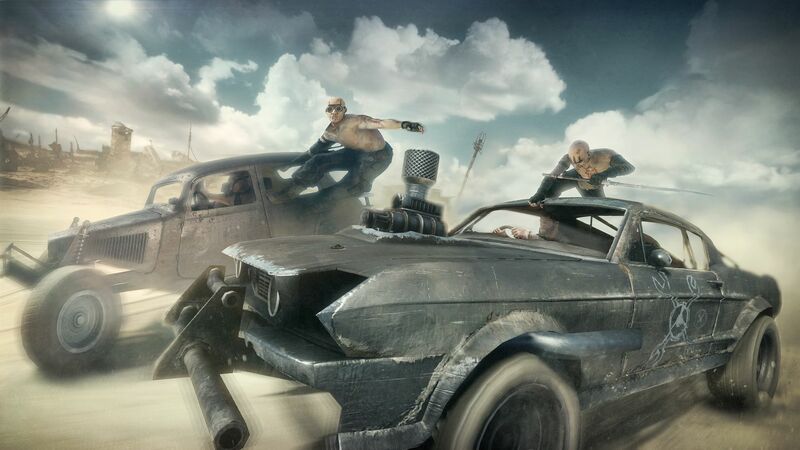 Mad Max features convoys around the world as well, as a group of cars work to protect a very valuable vehicle stocked with armor, scrap, and fuel. These battles are typically intense as you work through the pack to destroy the lead car. For me however, one of these fights got even more intense. As I was working to defeat the convoy and take it’s relic as my prize, more car horns blared as a second and completely different war party joined in from a connection road to jump in on the fun. So here we had myself, the enemy convoy of about 8-9 cars, and 3 additional enemies, all fighting each other. It was glorious chaos filled with explosions, crashed cars, and scrap flying all over the place. Unfortunately for me, I didn’t make it to the end. 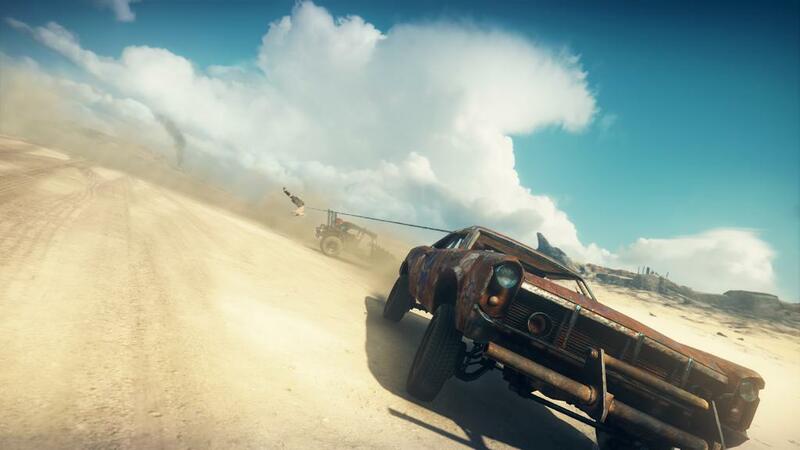 One of the cooler aspects to Mad Max revolves around the weather. Yes, in a game that features hot and arid landscapes, the world is occasionally met with these intense storms, many of you will be familiar with if you’ve seen Mad Max: Fury Road. These storms are completely random and sometimes, they can approach at the worst of times. These storms blanket the land in clouds, dust, and lightning making it extremely dangerous to be outside. Fearless explorers can find “mother loads” of scrap however so you’ll need to ask yourself if the rewards outweigh the risk. For me, it was and as a bonus, I was able to completely smash through a couple of enemy vehicles as well on my way back to a nearby stronghold. I made it back just in time as my car was 10% health away from exploding. When you’re in a massive storm, leaving the car is pretty much a deathwish. That’s it for now from Mad Max but with all the randomness that can and has happened out in the wastes, don’t be surprised to see another Emergent Storytime with Mad Max at some point. What about you guys? Anything interesting happen lately during a playthrough of an open world game? This entry was posted in Feature, Opinion and tagged Feature, games, Opinion, PC, PS4, Xbox One. Bookmark the permalink.